I didn’t manage to post a blog post on Ada Lovelace Day this year because I spent most of my spare time in the run up to the event looking for sources for the twenty contemporary Women in STEM nominated for Wikipedia article creation as part of the University of Edinburgh’s Ada Lovelace Day Editathon. The event itself is always one of the highlights of the year and this year was no exception. We had a really inspiring series of talks in the morning from the University’s Women in STEM and Physics Societies and the student WellComm Kings initiative. 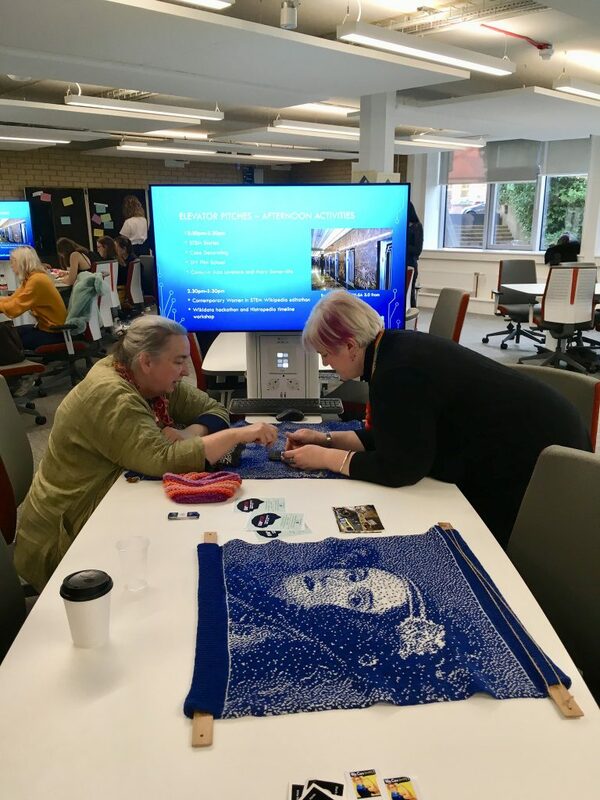 Mathematician and maker Madeleine Shepherd of Knot Unknot also came along and showed us her amazing knitted portraits of Ada Lovelace and Mary Somerville, which she created on a hacked knitting machine. We had a range of activities including DIY Filmschool and cake decorating followed by Wikipedia and Wikidata editing in the afternoon. Finding good quality secondary sources for contemporary academics can be tricky and it’s doubly difficult for female academics whose work is less visible and less widely reported. Wikipedia relies on independent secondary sources; it’s not sufficient for an academic to have published extensively, to be regarded as notable, it’s necessary to show that they have had a significant impact in their field. This can be problematic for female academics, and particularly for women in STEM, who routinely face discrimination on account of their gender. In an article titled Wikipedia is a mirror of the world’s gender biases, Wikimedia Foundation’s Executive Director Katherine Maher, noted that it’s somewhat disingenuous for the press to complain about Strickland’s lack of Wikipedia entry when the achievements of women scientists are routinely under reported. We need more reports and independent secondary sources so we can improve the coverage of women on the encyclopaedia. Wikipedia is built on the shoulders of giants. We’re generalists who learn from the expertise of specialists, and summarize it for the world to share. If journalists, editors, researchers, curators, academics, grantmakers, and prize-awarding committees don’t apply their expertise to identifying, recognizing, and elevating more diverse talent, then our editors have no shoulders upon which to stand. It’s time for these other knowledge-generating institutions to join us in the pursuit of knowledge equity. Wikipedia alone can’t change how society values women, but together we can change how they are seen. Mary Etherington was integral to the protection of the Exmoor pony breed after the war. She saw the importance of protecting the breed which was nearly extinct after the ponies had been used as a meat source during rationing and as target practise for the armies on Exmoor. Whilst she is well known within the Exmoor pony breed, I believe she may be lost to time due to her rural links and the general lack of representation for rural matters on Wikipedia as well as her being a woman. I really struggled to find many good sources about Mary online, but one of our editathon participants, Vicki Madden, was captivated by her story and determined to create an article about her. After some creative research and round about thinking, Vicki and Anne-Marie were able to find a whole range of independent sources and Mary Etherington now has her own shiny new Wikipedia entry. World-leading research into molecular mechanisms of dementia. Works tirelessly to promote public understanding of science through expert comment in press and public engagement activities. Lovely person and very supportive of other women. I hope her new Wikipedia article will help to raise awareness of her work to the general public and go a little way to replaying the support she has provided to others. This entry was posted in university of edinburgh, Wikimedia UK, Women in Tech and tagged ada lovelace day, ald18, higher education, OpenEdFeed, wikimedia, women in STEM. Bookmark the permalink. ← Wiki Loves Monuments 2018 – Pipped at the post!